Look at her go! 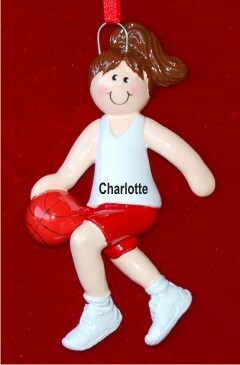 She's bringing the ball up court or taking it to the hoop in the brunette girl basketball personalized Christmas ornament that is perfect for players from elementary to high school age. It becomes an enduring keepsake of her playing days with her name and the year hand lettered by our artists in a very pretty font. These girls basketball ornaments personalized for your favorite players are ready to display when they arrive in our plush and pretty velvet gift bag. Let her know that you're proud of her hard work, improvement and success with the brunette girl basketball player personalized Christmas ornament from Russell Rhodes!